This article will cover the three different git config files and their scope. I have been using git for a few years now, but not studying it in depth … until now. Here is my current git issue I am working through. I have some repositories from my job I am working from. I set up my user.name and user.email in my ~/.gitconfig file (the global scope). Which is fine and dandy, and working well. But now I have some personal repositories that are re-using the same user.email and user.name from the global scope. I want them to use a different name and email, but only in these repositories. The first git config file "system wide"
Before I started this section I temporarily moved the "global" gitconfig file at ~/.gitconfig file to ~/.gitconfig-BACK. > git config --system user.name "Patrick Bailey"
The second config file "global"
The global gitconfig file, can be thought of as your personal gitconfig file. It overrides the global gitconfig file, if it has a variable that is in the global gitconfig file. > git config --global user.name "Patrick Test"
The global gitconfig is used before the system wide gitconfig. The third config file "Repository Specific"
This is a repository specific gitconfig file. And when I say repository specific I mean repository specific! I, unfortunately, still think in subversion. So when I saw "Repository Specific" gitconfig file I thought this file would be shared when you push/pull to a remote repository. It is not, when you clone a repository a generic "Repository Specific" gitconfig file is made, but it's not something that is stored in the repository. With that in mind this is the file I personally need to change in my local repositories to solve my personal git problem. > git config user.name "Patrick Specific"
The "Repository Specific" overrides the global config file. 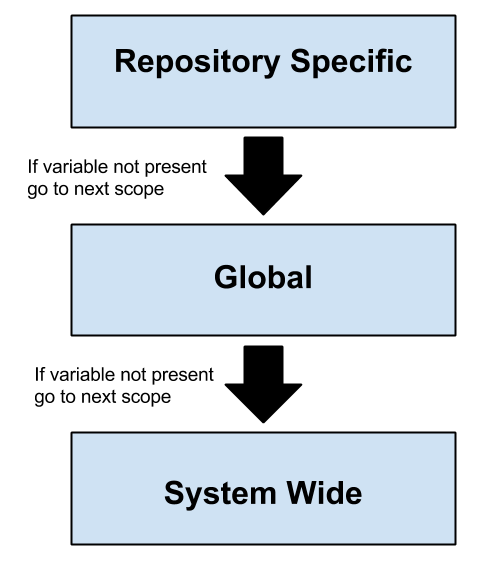 Here is a simple image to show which scope is used when git is looking for a variable. He suggest placing a .gitconfig file in your repository, as part of your repository. This file would be copied when cloned, much like the .gitignore. But if that is all you do the file will not be used. He suggest including a path to this file in one of the other three gitconfig file. I am still too new to git to see what advantages this would have with sharing variables with your team. But I thought I would make note of it here just in case.